Overlock seams perfectly and create amazing decorative effects. 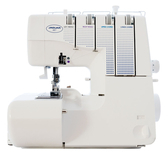 It features a needle threader, 2,3, or 4 thread sew and cut overlock stitches and an easy to follow thread guide. The Brother 4234D overlocker makes a beneficial assistant for beginners as well as more experienced tailors, use the Brother 4234D as either a 2, 3 or 4 thread Overlock, the 4234D will trim, edge and neaten for a professional finish which won't fray or unwind. FAST lower looper threading & colour coded threading system makes it easy to thread up the overlocker and with a manual plus Instructional DVD. This, plus the manual tension release and the "easy thread" left looper makes threading this overlocker easy as it gets. The free arm facility is the cylinder on the 4234D which allows you to sew items such as sleeves and trouser legs. It also provides overlock stitching suitable with a wide variety of heavy, stretch and light fabrics. Suitable for a wide range of fabrics including silks to thick layers of denim and stretch fabrics. 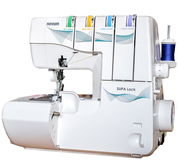 The Brother 4234D machine has wide range of stitches for decorative purposes and utility stitching. The portable Overlocker provides sturdy performance at quick speeds of 1,300 Stitches per minute. 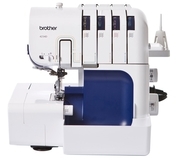 The Brother 4234D offers a choice of two sewing surfaces namely free arm and flat bed. You can choose for 3 or 4 thread cut and sew stitches options. The Overlocker comes with different settings that you can use for handling different types of fabrics. Narrow and rolled edges are no problem for this compact but powerful machine. 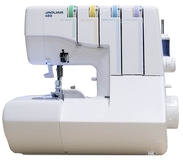 Other features include differential feed ratio of 0.7 to 2.0 for improved stitch quality, create stitches from 2.0mm to 4.0mm in length and 5.0mm to 7.0mm in width and Automatic Needle Threader. This Overlocker includes Blind Stitch Foot and Trim trap for storage of the foot pedal and for catching fabric. It worked more or less out of the box. After threading it (thought you might have left a bit more cotton on!) my wife was sewing a hem on a dress 20 minutes later. It sews an extremely neat 2 mm finish out of the box and we haven't changed that yet. Initially starting sewing the item sounded as though it wouldn't move but after checking everything and pressing on it worked smoothly and quickly. It just sounded differently to our old item. Threading is easy using the tie on method but the bottom looper will still be tricky (but not difficult) Your service was top class; you kept us informed of the delivery by email and the tracking of the order was brilliant! All in all we are very pleased with the item, the price and will recommend GUR to all our friends. Thank you.